No matter how lush your landscaping, it can always use color from blooming flowers. Plan your beds so you have a succession of flowers from early spring to late fall with a combination of bulbs, annuals and perennials. Match the selection of flowers to the style and color of the house as well as how much time you have for planting and maintenance. A Victorian mansion requires a different planting scheme than a mansion designed by Frank Lloyd Wright. A ranch-style house looks fine with a country garden, but would look out of place with a formal garden of topiaries. Match the architecture of your house with your flower selection. Take an afternoon and visit the neighborhood library. Scan through the home and garden magazines to see what types of landscaping appeal to you. While you're there, look through the home and garden books for more ideas. 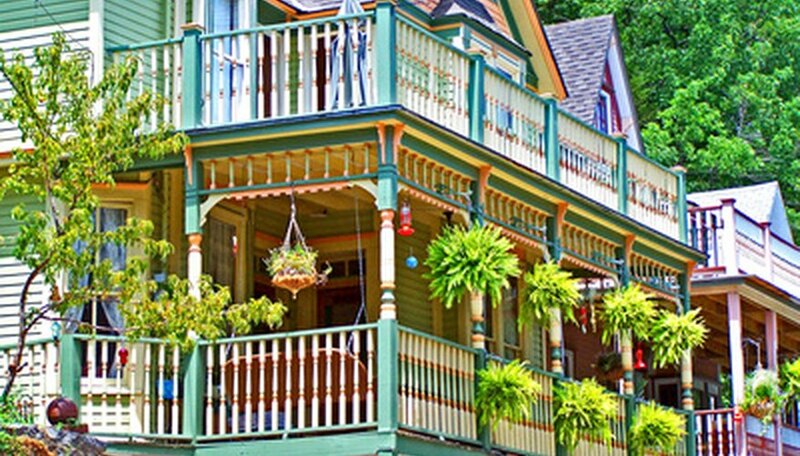 Victorian homes look good with lots of roses, lilies and topiaries. Ferns hanging in baskets are typical on the porch. Modern houses accented with geometrically shaped plants that bloom look good. Daylilies have a fan shape that goes with modern. Alliums with their strappy leaves and big, round flower heads are another good choice. Country flowers include daisies, hollyhocks, larkspur and zinnias. Planting all red roses against a red house doesn't do anything for the house or the roses. Plant flowers in colors that will stand out against the house and integrate the color of the house in the flowers. White and blue flowers would be a better choice for a red house. Add in a few red roses and they'll pop out against the blue and white flowers. In beds away from the house, pick up the red color with more red roses or other red flowers like geraniums. Continue the color scheme of white and blue in those beds, but make red the predominant color. If the house has trim, using that color as the main color in the flower beds makes both the trim and the flowers stand out. Pick colors for the flowers that are opposite your house's main color on the color wheel. The color wheel has red, yellow and blue, the primary colors at noon, 4 o'clock and 8 o'clock. Orange is between red and yellow. Green is between yellow and blue. Purple is between blue and red. If your house is painted yellow, choose flowers in shades of blue. If the house is orange--or a light beige with hints of orange--choose purple flowers. Add white flowers to keep the flower bed from being too monochromic. If the house is green, use red flowers. If the color contrast is too bold, tone down the colors of the flower a few shades. For example: Instead of red flowers against a green house, use flowers in different shades of pink.